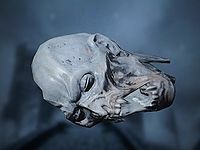 Retrieve vampire parts from varied locations around Skyrim. Retrieve the Ancient Vampire remains. Speak to Feran Sadri and he will tell you his theory that adding the blood of an ancient vampire to the Bloodstone Chalice can lengthen the amount of time its effects last. He will send you to a random location, telling you to retrieve one of five petrified vampire parts from a boss level chest at the location, and infusing the remains' lingering magical essence into the Bloodstone Chalice. Report back to Feran Sadri to conclude the mission, ending with him telling you the effects of the Bloodstone Chalice will last longer now. Drinking from the Bloodstone Chalice grants the Blood of the Ancients ability which augments the Vampiric Drain spell when in Vampire Lord form to absorb stamina and magicka as well as health for one day by default. The same body part can be requested more than once. The in-game description of the 'Blood of the Ancients' spell is not directly linked to its duration. The duration of the spell is calculated based on the DLC1VampireChaliceStopDay script and affixed to a specific day, while the description shows the effectively meaningless magnitude of the spell. This means that the Necromage perk, which increases the magnitude and duration of spells cast on undead (such as your vampiric self), causes the description in your 'spells - active effects' menu to display that its duration is increased by 25% (which in turn is caused by the perk's effect on magnitude, not duration), but the spell actually lasts only as long as calculated by the Chalice's level (as indicated in the table above). ? 10 Feran Sadri has sent me to retrieve the <Alias=Remains> from <Alias=Dungeon>. After infusing the magical essence lingering in the remains into the Bloodstone Chalice, the power granted to us from drinking it will last longer. 255 Finishes quest Feran Sadri sent me to retrieve the <Alias=Remains> from <Alias=Dungeon>. After infusing the magical essence lingering in the remains into the Bloodstone Chalice, the power granted to us from drinking it will last longer. The following empty quest stages were omitted from the table: 0. On the PC, it is possible to use the console to advance through the quest by entering setstage DLC1RV05 stage, where stage is the number of the stage you wish to complete. It is not possible to un-complete (i.e. go back) quest stages, but it is possible to clear all stages of the quest using resetquest DLC1RV05. This page was last modified on 24 December 2017, at 01:04.